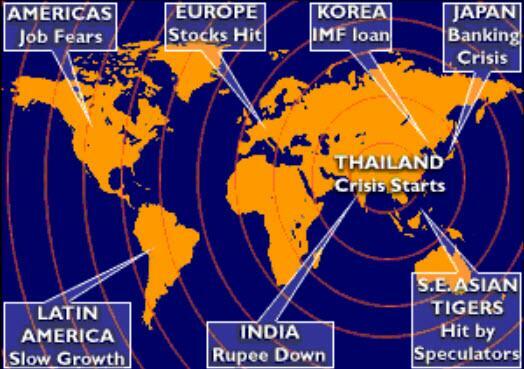 The 1997 Asia Crisis: "We Were There"
Having covered cyclical industries (primarily autos, in my case) since the early 1990s, I vividly remember every financial crisis of the last 30 years because “my” stocks always get destroyed in the process. Based on that experience I can tell you every such event feels unique and shocking as you transit through them. To borrow from Tolstoy, every happy market is the same, but every crisis market is different in its own way. The Turkish lira crisis is getting a lot of comparisons to the 1997 Asia crisis, so today we’ll play the part of crusty market veteran and outline a framework to evaluate some similarities and differences. We have a more emerging-markets specific take on things in our Data section, so we’ll keep this part pointed at US equity and bond markets. #1. Like today’s US equity market, in 1997 stocks had already posted many years of strong performance. From 1982 to 1996, the S&P 500 had only logged one down year (1990, down 3.1% on a total return basis). Average annual total returns were 17.2% across that 15-year span. The comparison to now: in the 9 years since the 2008 Financial Crisis, US stocks have averaged a 15.5% total return with no down years in terms of total return. Bottom line: man-made financial crises tend to occur at the end of a long run of strong economic growth/financial asset returns, and every investor knows this. That’s an important reason why the situation in Turkey resonates as an important risk factor just now. #2. The spillover effects of the 1997 Asia crisis took many months to reach US stock markets. The problems started in early July with the Thai government devaluing the baht, which came as a surprise to markets despite Bangkok’s clearly dwindling foreign currency reserves. Other Asia countries – the Philippines, Malaysia and Indonesia – followed suit. Growth slowed across East Asia, damaging the Hong Kong and South Korean economies as well. Meanwhile, back in the US, the S&P 500 was up 7.0% in July. It then treaded water between 900 and 970 until October 27th, when it fell 6.9%. That one-day drop is why US investors remember the Asia Crisis (that is certainly the case for me), and primarily because the NYSE took the controversial step to end trading early that day. Bottom line: remember that the S&P 500 posted a 33.1% total return in 1997, a stellar return. 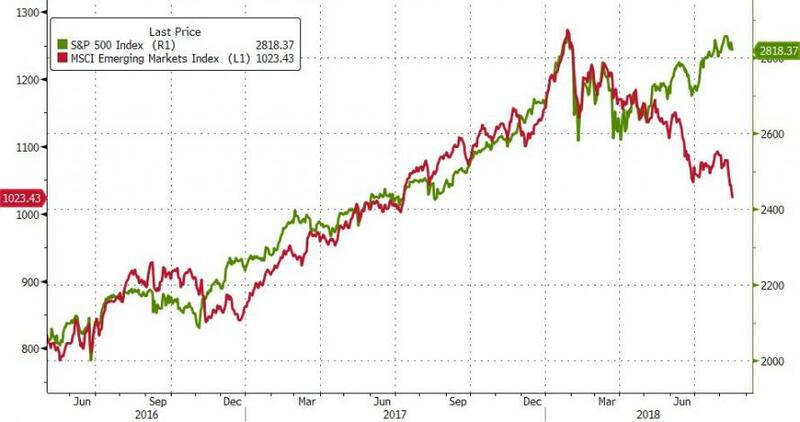 The Asia Crisis did cause a dramatic risk-off day as global equity investors finally panicked about potential global spill over of the problems in Southeast Asia. But there were also positive effects on the US economy, such as lower inflation from cheaper imports as well as lower long-term interest rates as investors bought Treasuries to reduce portfolio risk. #3. Even if history ends up rhyming “Turkey” and “Thailand”, there are important structural differences between 1997 and 2018.
and global synchronized recession with strong deflationary pressures. By the Fed’s analysis the US banking system can withstand those extreme events without cratering, so a milder financial shock like an emerging markets crisis should leave banks able to support consumer and business lending rather than seizing up and causing a recession. Bank stocks may not do well (they have taken a hit in the last week), but the banking system itself should prove sound. If investors believe the Fed’s stress tests, this may even reduce equity market volatility versus past crises. On the bearish side of things, the current Turkish situation sits against a very different geopolitical backdrop than the 1997 Asia Crisis. Back then, everyone from the IMF to the Federal Reserve stepped in, and the economies in question took the medicine required to turn things around. There is little proof the current administration in Ankara would do the same, and the fractured relationship between the US and Turkey will not help either. Emerging market crises take time to develop, and at first US stocks will ignore any potential impact. US equities can continue to rally even as a crisis takes hold, provided there is no adverse impact to the US economy. The Fed’s post Financial Crisis stress test process should make that more likely than in past cycles. EM crises do make the chance of wild – but short – swings in equity prices more likely. Forewarned is forearmed on this point.